B.Y.O.C. (Build Your Own Clone) is a company in Eastern Washington that makes and sells kits reproducing old/classic guitar effects pedals. I became interested in them on account of the first effect I ever owned: a Dunlop Crybaby wah I bought new in Maryland in 1996. What an effect! Such classic sounds. At least I think so — it worked for a year or two and then it didn’t, but I couldn’t bring myself to throw such a heavy piece of metal away. I was looking at it one day around ten years later and wondered if anyone made a kit to replace the electronics in these. It turned out that B.Y.O.C. does, so I ordered it. I’ve tried for years to understand electronics but sadly haven’t gotten as far as I’d like, so I can’t speak much to the circuit or what it’s doing, but I can say that it’s more involved than the circuit being replaced. There are more components and, more importantly, more input points for altering the effect’s sound. In this photo you can see the original circuit board sitting off to the left. There’s not much there. Also in this photo, notice the white plastic bit above the two 1/4″ jacks and below the blue switch. 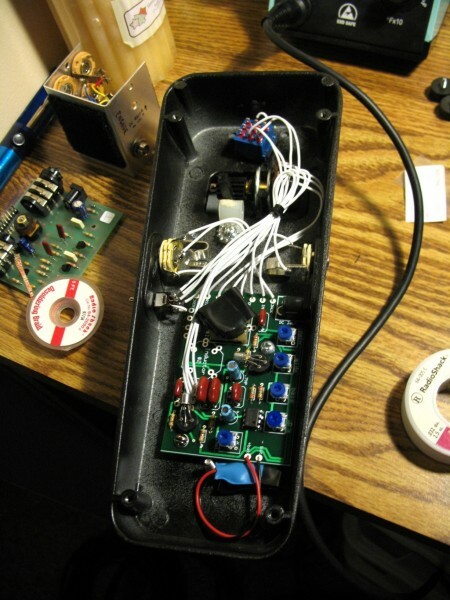 That’s part of the original equipment connecting the pedal’s rocking motion to the potentiometer controlling the “wah” sound. The kit provides a replacement pot but you need intact pedal hardware to make it work (alternately you can buy all of the above from BYOC). Of particular interest in these new innards are a number of on-board potentiometers that radically alter the “wah” parameters. After the build you’re meant to set these according to taste, but then can’t change them without opening up the unit. You can get around this by drilling holes, installing panel-mount pots, and wiring them into the board to replace the supplied board-mount pots. I haven’t done this yet but plan to eventually. Here’s a closeup on what I’m talking about, the dark blue things. The B.Y.O.C. kits are well-made and easy to build, and the build is quite enjoyable. 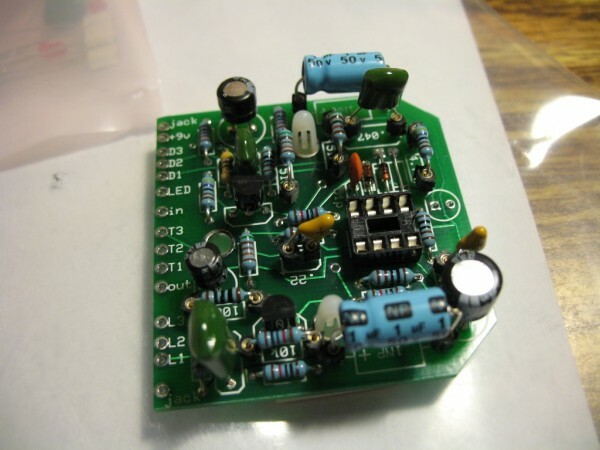 A few days of soldering and I had a wah again, though I haven’t found a lot of use for it. I use it in one An Invitation to Love song (our ballad “Leo”) when we go into a noisy/loop/instrumental section at the end. I activate the wah to make an awful racket that announces the imminent end of the song. Sadly I don’t have that bit recorded, otherwise I’d post it here. On the success of the wah build, I ordered the B.Y.O.C. Overdrive kit. 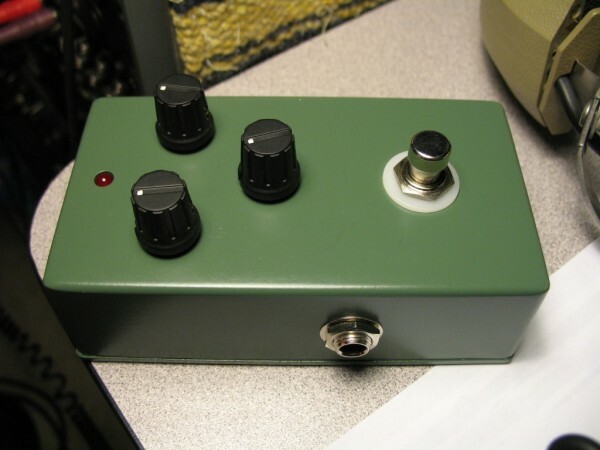 I have a Boss SD-1 overdrive that I modded from a different kit I got on Ebay… that’s another article. It’s a great mod and sounds just fine, but the effect is not true bypass, and I notice it in my somewhat longish effect chain. The B.Y.O.C. Overdrive is true bypass, and I like building these things, so I ordered it. The B.Y.O.C. Overdrive is essentially a Tube Screamer clone. I’m not sure why but the original Ibanez TS-808 is the platonic ideal of overdrive pedals, but it is, and many overdrives on the market (including the SD-1) are based on the original Tube Screamer circuit. Rather than pay exorbitant amounts for an original TS-808, one can select from among a million “boutique” recreations made by half a million “boutique” engineers/pedal peddlers. A kit such as this one is probably the cheapest way to get your own recreation, and runs about $70. 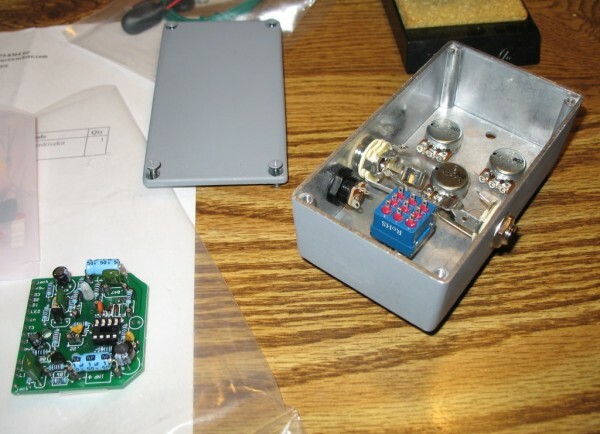 The main difference build-wise between this and the wah kit is this one came with an enclosure, and is unfinished. So I had to prime and paint it, but once again the whole thing was easy and fun. The enclosure is primed. I completed the build and tried it out for a while before final paint. B.Y.O.C. does a nice job of a. knowing about and then b. enabling you to apply modifications to the standard circuit, allowing you recreate some of the aforementioned manufacturer mods (like those in the Boss SD-1), or other mods that have been discovered by users over the years. 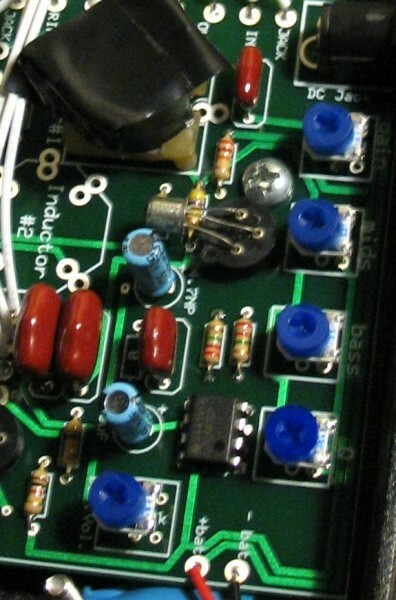 The SD-1 mod in particular applies an “asymmetrical” configuration of diodes in a particular section that alters the overdrive waveform to get “that SD-1 sound.” Even though I was building this kit to effectively replace an SD-1 I opted to keep the standard TS-808 configuration, at least to start with. I should probably make YouTube videos of this thing like some people do but that’s more trouble than I have time for right now.